Support the Irish Guide Dogs. We are delighted to welcome the Irish Guide Dogs to TAPSTAK! Contact, support or donate to the Guide Dogs at the tap of a button with the new Guide Dogs micro-app! Irish Guide Dogs is Ireland’s national charity dedicated to helping people who are vision impaired and families of children with autism to achieve improved mobility and independence. The core purpose of the guide Dogs is to enable people with sight loss and families of children with autism to lead better lives, become more independent and more mobile. 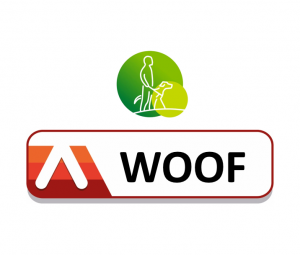 With the aim to provide the highest quality of services in partnership with their clients, the Irish guide dogs organisation is primarily funded through voluntary donations and fund-raising through a network of Volunteers across the country. 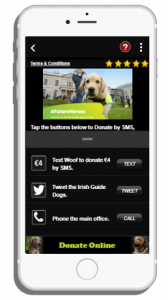 Donate to the Irish Guide Dogs by SMS. Call the Irish Guide Dogs Head Office. Tweet and show your support to the #FutureHeros. Click through to the donate on-line Page to make a donation. …All at the Tap of a button! Haven’t Downloaded The TAPSTAK mobile App yet? TAPSTAK is currently available to download in Ireland on both Apple and Android. Would you like to receive updates when the latest micro-apps go live? Follow us on social media for the latest STAK listings and TAPTAGs!